The number of cross border shootings between the United States and Mexico has sharply increased in recent times. Tensions between the two countries have risen since last year, as the Trump administration has pressed for Mexican funding of a border wall, Immigration & Customs Enforcement officers have cracked down on illegal immigrants, and the political rhetoric of nativism and xenophobia has intensified. In the ongoing case Hernandez v. Mesa, the main question raised is whether the family of Sergio Hernandez, a Mexican citizen fatally shot in Mexican territory, can sue Jesus Mesa Jr., a United States Border Control agent under the Fourth Amendment, which, among other things, protects against excessive force. This case deals with a number of controversial issues: When the legislative branch is paralyzed by political gridlock, is the judiciary obligated to deliver justice to non-citizens? How are state police and federal agents held accountable for their actions? To what extent should American values and legal protections apply to foreigners? In this case, the Supreme Court was petitioned to establish a standard determining the limits of the extraterritorial application of constitutional rights; they declined to issue a ruling on the case, sending it back to a lower court on June 24. The Court was right to be wary of granting protections in this case, because supposed precedents concerned situations substantially different from Hernandez’s; other accountability mechanisms normally exist for border agents; and the executive and legislative branches of government are better equipped to handle foreign affairs. One facet of the overarching argument on Hernandez’s behalf is that, since the U.S. employs agents to patrol border territories, actions by agents within those areas should be constitutionally regulated. Amnesty International composed an entire brief consolidating this line of reasoning, asserting that “the constitutional right to freedom from unreasonable seizures is not confined to U.S. citizens or aliens with a ‘previous voluntary connection’ to… the United States, but extends to aliens who are present in areas under the effective control of U.S. law enforcement agencies” (Brief amici curiae of Amnesty International USA, et al., p. 3). While members of this international human rights organization rely upon Boumediene v. Bush—a case that granted constitutional rights to inmates at Guantanamo Bay—to support their argument, they misinterpret specific qualifying conditions for the extension of rights and ignore the contextual circumstances of the case. The United States lacks effective control in border areas relative to detention centers on foreign soil, as was the case in Guantanamo. In Johnson v. Eisentrager, the Supreme Court held that non-citizens outside the sovereign territory of the U.S. are not entitled to constitutional rights. The Court found that war criminals held in U.S.-administered military custody at Landsberg Prison in Germany were not able to enjoy constitutional protections, since the location was “beyond the territorial jurisdiction of any court of the United States.” (Johnson v. Eisentrager, p. 778). However, case precedents like Boumediene have held before that foreigners on non-U.S. territory can sometimes still have constitutional rights. Together, these cases present the logical steps courts must follow in order to determine the applicability of constitutional rights to areas outside of the United States. While the plaintiff argues that these precedents, each with distinct contexts and circumstances, grant Hernandez rights in his case, they ultimately do not. In Boumediene, for example, the Court determined that constitutional protections apply to aliens at Guantanamo Bay because the detention center is an area that the U.S. has total control over; however, international border areas are different. The authority of the U.S. in international border areas is not comparable to the sovereignty exercised in places like Guantanamo Bay, Cuba. Boumediene described U.S. authority at the detention center as “total military and civilian control,” “complete jurisdiction and control,” “plenary control,” “practical sovereignty,” and “complete and uninterrupted control” (Boumediene v. Bush, p. 755). At the detention center, there are military personnel who actively patrol all areas of the camp daily. The center is located on land that the United States leases and has total control over. On the other hand, evidence from the original panel opinion in Hernandez suggested that federal border control agents only occasionally operate in the border zone, sporadically passing through different portions of the border at different times. In short, international border areas are not exclusively under United States control or jurisdiction and are less regulated than the detention center in Cuba, so they do not constitute areas where the U.S. has effective control. Furthermore, United States v. Verdugo-Urquidez established that the Fourth Amendment only protects aliens with significant voluntary connections to the U.S. One judge, dissenting from the Fifth Circuit’s opinion in Hernandez, relied upon this test to conclude, “the Fifth Amendment does not protect a non-citizen with no connections to the United States who suffered an injury in Mexico where the United States has no formal control or de facto sovereignty” (Hernandez v. Mesa, p. 49). Hernandez’s situation contrasts markedly with the one in Ibrahim v. Department of Homeland Security, where the Court did find voluntary connections to the United States. In Ibrahim, the plaintiff-appellee studied in pursuit of a doctoral degree at an American university, which she had left “only in order to attend an academic conference abroad” (Amicus curiae brief of the United States, p. 10). Also, in this case, the appellee had family connections in the United States—her grandparents were lawful permanent residents (Ibrahim v. Department of Homeland Security p. 983). The results of Eisentrager, Verdugo-Urquidez, and Ibrahim show exactly why Hernandez should not have constitutional rights extended to him. Unfortunately for Hernandez’s counsel, he lacked the voluntary connections necessary and was in Mexican territory at the time of the incident. Perhaps justifiably, some people have expressed concern that the border areas will become regions of total lawlessness if constitutional rights do not apply there. However, there are federal criminal procedures that can hold people accountable. Current law adequately restricts agents from shooting irresponsibly into Mexico by providing for strict disciplinary measures from the federal government. Although the U.S. declined to extradite Mesa in this case, in general, the Mexican courts also have jurisdiction over any tort or crime that may arise from a fatal injury in Mexico. The United States has instituted criminal proceedings specifically for cross-border shootings which address concerns that future murderers will be let off the hook. For instance, the U.S. brought a federal murder charge against a border patrol agent who was in the United States when he shot and killed a sixteen-year-old Mexican citizen who stood on Mexican soil (Brief of petitioners p. 25). Moreover, there are concrete foreign policy reasons behind why it might not be prudent to extend Fourth Amendment rights to foreigners in the border regions. A judge for the Fifth Circuit in Hernandez, who concurred with the majority opinion at the en banc panel stage, reasoned that “judicial entanglement with extraterritorial Fourth Amendment excessive-force claims” would be “impracticable and anomalous” (Brief for the United States, p. 6). The judicial branch is not the appropriate branch of government to deal with the politics of international affairs. A ruling in favor of Hernandez may overstep the bounds of the judicial branch and violate the separation of powers. Policy concerns are best dealt with in the executive and legislative branches, as both more commonly interact with international authorities. Congress, in the Federal Tort Claims Act, specifically barred liability for claims involving “injuries occurring in a foreign country” (Sosa v. Alvarez-Machain, p. 692). The legislative branch was concerned about such claims because the judicial branch usually has the least expertise in dealing with foreign relations. In an amicus curiae brief, the U.S. stated that a court should be hesitant to create constitutional law with extraterritorial scope that implicates the issues that Congress evaded when it legislated on the topic (Amicus curiae brief of the United States, p. 2). Practical concerns should therefore outweigh emotional instincts to provide constitutional rights to non-citizens. The story of Sergio Hernandez’s death is heartbreaking. Back in February, the Supreme Court heard oral arguments on this case. 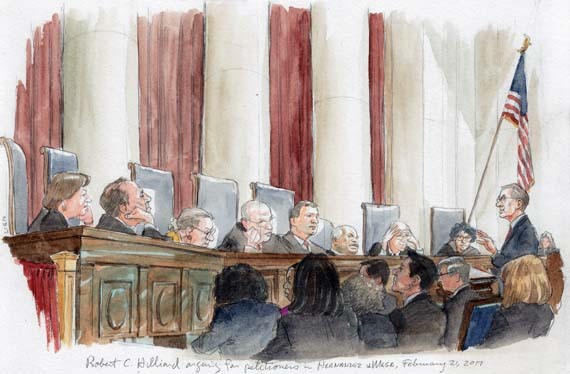 As they deliberated, justices cautiously approached the implementation of new case precedent. Extending constitutional protections to a foreign national with no connection to the United States, simply because he was in an international border area, should not be a correct or permissible application of the law. Because Mexican territory is not governed by the U.S. Constitution and because the federal government already adequately addresses cross-border shootings, existing case precedents like Eisentrager, Verdugo-Urquidez, and Ibrahim, which address international encounters, indicate that the Court should restrict rights in the current case of Hernandez v. Mesa. In the uneasy U.S.-Mexican geopolitical terrain regarding sovereignty and territorial integrity, cases of cross-border encounters, like the situation of Sergio Hernandez, must be meticulously considered with clear and pragmatic legal reasoning. “Amicus curiae brief of the United States,” Rodriguez v. Swartz, 111 F. Supp. 3d 1025 (D. Ariz.
2015). Web. 15 Jan. 2017. Bivens v. Six Unknown Named Agents, 403 U.S. 388 (1971). Boumediene v. Bush, 553 U.S. 723, (2008). (December 9, 2016). Web. 15 Jan. 2017. 2016). Web. 15 Jan. 2017. Ibrahim v. Department of Homeland Security, 669 F.3d 983, 994-97 (9th Cir. 2012). Johnson v. Eisentrager, 339 U.S. 763, (1950). Rodriguez v. Swartz, 111 F. Supp. 3d 1025 (D. Ariz. 2015). Sosa v. Alvarez-Machain, 542 U.S. 692, 704 (2004). United States v. Verdugo-Urquidez, 494 U.S. 259, 271, (1990).